The Collaborative for Academic, Social and Emotional Learning (CASEL), defines SEL as the process through which children and adults acquire and effectively apply the knowledge, attitudes, and skills necessary to understand and manage emotions, set and achieve positive goals, feel and show empathy for others, establish and maintain positive relationships, and make responsible decisions. The foundation of SEL is targeted to raise awareness of the role that SEL core competencies (self-awareness, self-management, relationship skills, social awareness and responsible decision-making) play in creating safe, engaging, culturally responsive, and personalized learning experiences for student and adults. Establish and maintain healthy and rewarding relationships with diverse people and groups. During the 2018-2019 school year, all middle schools have incorporated SEL into the academic day, as well as into overall school culture. Several elementary schools have also implemented the Second Step curriculum in all homerooms. At each school, the SEL Specialist collaborates to ensure social emotional learning is embedded throughout the day. 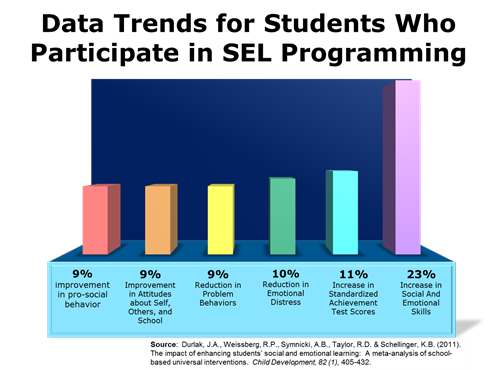 The SEL Specialist provides guidance and support in the area of Social Emotional Learning initiatives. The Specialist directly supports campuses and the district to ensure that all current and anticipated social and emotional learning initiatives are implemented with fidelity.